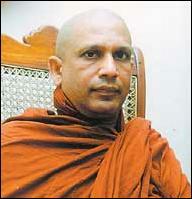 The Director of Colombo Crime Division (CCD), Mr. D. S Lugoda said that the main intention of the report was to investigate whether there was a deliberate intent to instigate widespread disturbances using the monk’s funeral as a pretext. Rumours were spread on Christmas Eve in Colombo and many areas around the city that some Tamils had disrupted Rev. Soma’s funeral. “Our personnel in mufti saw groups of agitated funeral attendees questioning some persons belligerently. Hence we took those persons into custody to prevent the matter erupting into general violence. But the word spread fast that the persons whom we took into custody were distributing leaflets denigrating Ven. Soma. That incited the angry crowd to attack the Police Bus”, a Police officer said. 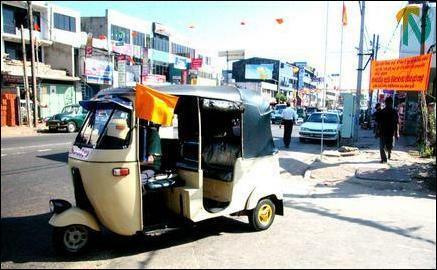 An auto rickshaw with a saffron Buddhist flag on Monday in Colombo- still mourning the demise of Ven. Soma. “They accosted these persons at different points at the funeral venue. The main reason was that they looked like Tamils. So the crowd, incited by speeches, posters, scurrilous leaflets and above all the rumour mill worked overtime by certain parties with vested interests, whipping up racial and religious hatred during the days leading up to the monk’s funeral and some of the incendiary speeches by some of his peers in the Buddhist clergy at the funeral itself, set upon these persons. "The crowd that stopped one of them demanded that he show them his national identity card. And when he opened his purse to take it out to prove that he was a Singhalese indeed, the agitated crowd saw an image of Mary, Mother of Jesus in his purse. He was immediately set upon and severely assaulted," said a journalist who witnessed the incident. According to Mr. Lugoda, 50 civilians and 15 Police officers were questioned regarding the incident. Police sources said that they found nothing defamatory in the leaflet alleged to have cast aspersions on Rev. Soma. However, they arrested five on suspicion at the funeral last Wednesday, 24 December, he said. One of them has been remanded until 29 January after he escaped from protective custody of the Police from hospital where he was receiving treatment for his injuries. 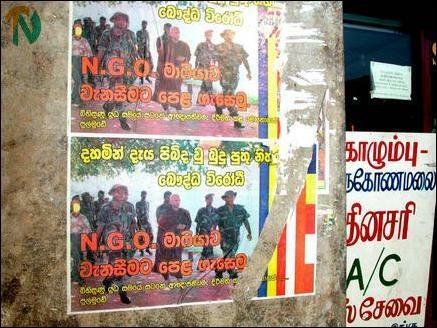 The anti NGO poster in Colombo's predominantly Tamil suburb of Wellawatte. Thousands of colour posters are still visible on walls and buildings along the city’s main artery, Galle Road and its suburbs showing the late Ven. Soma walking with Sri Lanka army officers. The posters lambaste NGO’s, which have been widely portrayed by Ven. Soma and his Sinhala nationalist ilk, as the very basis of a “diabolical conspiracy’ by Christian powers to undermine the Sinhala Buddhist nation through conversion and by corrupting its political leaders. “Let’s defeat the NGO mafia”, declare the posters ominously. “That Ven. Soma is shown with the Sri Lanka army in this poster is a veiled rise up call to the military – exhorting it to demonstrate its true patriotic role as the guardian of the Sinhala Buddhist nation," a leading political columnist for an English weekly published from Colombo told TamilNet. Rumours were also spread that the chairman of Sri Lanka’s largest private business house, the Ceylinco Group, had written a will to give all his personal and family wealth to the Vatican after his death. The chairman of Sri Lanka’s most powerful banking group, Hatton National Bank, is also a Catholic. Thousands of posters were posted in many parts of Colombo during the days leading up to the funeral, accusing the Ceylinco Group chairman, Mr. Lalith Kotalawela of being a traitor to the Sinhala nation. The Singhalese have been closely associated with Christianity since the 16th century, when the Sinhala ruler of most parts of the island converted to Christianity, calling himself Don Juan Dharmapala, and when most of his coastal subjects began emulating Portuguese culture. Both political dynasties that ruled Sri Lanka since the British gave independence to the island had strong Christian antecedents. The first king of the Kandyan kingdom, frequently held up as an instance of Sinhala resistance to western imperialism was actually a catholic Sinhala soldier who had got his religious instruction in Goa, the Portugese stronghold in northwestern India. He too like modern day Sinhala politicians gave up his baptised name, Don Juan, and adopted Sanskrit derived name - a common practice among 'puritan' nationalists among Singhalese. The hatred whipped up against Christians among the Singhalese was also calculated to expose a seriously soft underbelly of Prime Minister Wickremesinghe, whose father was a devout catholic. Mr. Wickremesinghe’s brother is a senior Catholic priest. “The incident at the funeral would have certainly sparked an ugly pogrom not only against Christians and Tamils but Muslims too. It did not happen only because the state did not want to back the racist elements that were rearing to vent their xenophobic hatred on all non-Sinhala Buddhists," the columnist for the English weekly said. “Although rumours and propaganda during the days leading up to the funeral of Ven. Gangodawila Soma on Christmas eve targeted Christians in the main, as the insidious conspirators behind the controversial monk’s death, we should seriously take into account how fast it turned into anti Tamil hatred. The speed at which the rumour that Tamils had disrupted the funeral spread in some parts of the city shows beyond any doubt that the dangerously xenophobic compulsions of Sinhala Buddhist nationalism are still very intact. Untouched by all the modernisation one sees in Colombo," commented Mr. Sivasakthi Anandan, a Tamil National Alliance MP. “Tamils cannot ignore this. They cannot sit back and say that the outburst of hatred was directed only against Christian Singhalese. It is definitely an alarm clock for the Tamils," he emphasised.